Cyclesnack: New home for the Blunts! After a test ride last October at Bear Brook State Park, I got an offer I couldn't refuse on the next frame I am going to race/ride on in 2011 and maybe many years to come. While every wannabe mountain bike racer dreams of the elusive free bike and associated gear, until you get that opportunity, the peanut gallery that I find myself in has to take any opportunity I can find. 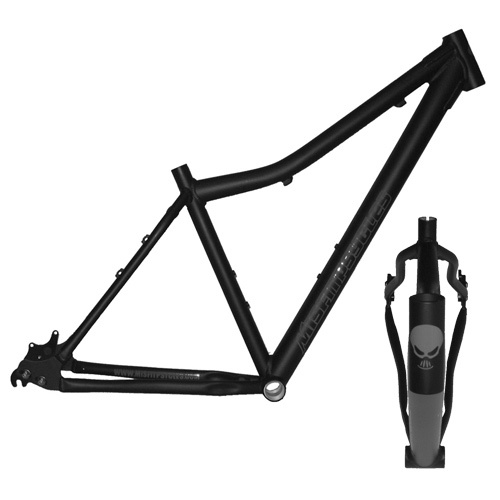 When I saw the Misfit Psycles Newsletter in my email inbox Friday morning with the offer of getting this frame at $200 off the regular price, I said to myself Happy Birthday! My birthday happens to be next month so I pulled the trigger! Yes, the MK IV is the penultimate version which means the mad scientist of PsycleLabs must be planning a MK V (Go Speed Racer, Go! Never saw the movie, but loved the cartoon when I was a kid) version soon. While I had envisioned getting a custom paint job, price is paramount in the peanut gallery, and besides everything goes with black so seeing that the Blunts are greenish, almost chartreuse looking, I have always liked anything green on black. I am thinking of going with the new Avid BB7s and Clark Cables (because they have a matching Green), but that's probably going to be it as far as color matching goes. I just have to work out how I am going to buy a squishy fork. We'll see about that, I am not sure I need two aluminum single speeds in the stable. Those green Blunts will look sweet on there. Misfit is about 4 lbs, and I'd imagine the Blunt wheels are around the same; you're off to a good start towards a fairly light build.